The tickbird and the giraffe have a symbiotic relationship that some scientists describe as mutualism and some as parasitism. This interspecies partnership is lopsided in favor of the giraffe because he can live without the tickbird, while the tickbird is dependent on the giraffe for much of his food. A close ecological relationship involving two or more species can benefit all parties (mutualism) or none (competition). It can also benefit one party without affecting the others (commensalism) or help one while harming the others (parasitism). The relationship between the giraffe and the tickbird hovers somewhere between mutualism and parasitism because the tickbird seems to derive greater benefit from the relationship than the giraffe. The giraffe is a large mammal that lives on the African savanna along with other large grass-eaters, including the Cape buffalo, rhinoceros, hippo, zebra and various antelope species such as the wildebeest, impala and eland, as well as domestic cattle. 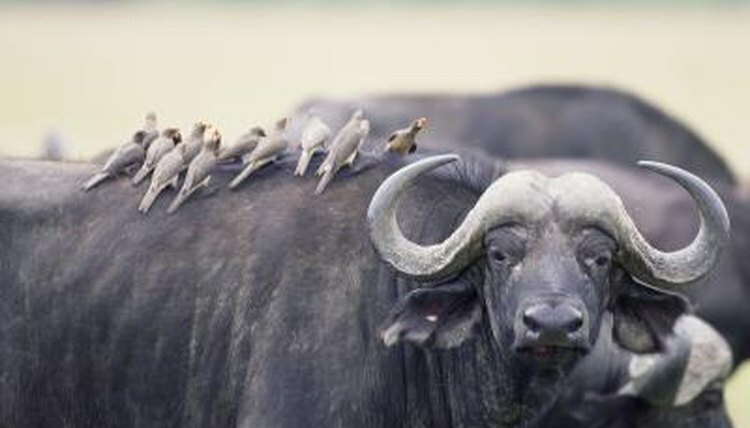 All these and many others host the oxpecker or tickbird. This bird has long been thought to remove ticks from its hosts, to the benefit of both—the bird eats the ticks, and the host is relieved of blood-sucking, disease-carrying parasites—but recent studies reveal that this process is less than benign. A secondary benefit to a host from the tickbird's presence is a sort of early warning system, since the birds make a hissing sound if they sight an enemy. This is of less benefit to the giraffe than to other hosts because the giraffe has the advantage of great height and keen eyesight and is fully capable of spotting predators without the bird's assistance. The tickbird is likely of greater benefit in this capacity to the nearsighted rhino. The two species called tickbirds, the red-billed and yellow-billed oxpecker, are perching birds with feet adapted for grasping, which allow them to ride on a host while looking for a meal. They sift through the host's hair looking for insects, but their first preference is for blood-swollen mature female ticks. This choice leaves immature disease-carrying ticks free to bite the host and pass on bacteria and viruses, the first blot on the bird's reputation as a host benefactor. According to researcher Paul Weeks, reporting in the journal "Behavioral Ecology," red-billed oxpeckers can and do enlarge tick bites and other wounds on hippos and cattle by probing them repeatedly for food in the form of blood, serum and tissue, casting them more as vampire-like parasites than as mutualists. This implies a far more complex symbiotic relationship between the birds and each of their various hosts, including the giraffe, than previously supposed. A clear example of mutualism is the relationship between the Nile crocodile and the Egyptian plover: the crocodile leaves its mouth open while basking on the shore, and the bird walks in and picks bits of rotting flesh from between the croc's teeth; the plover gets food and the croc gets a cleaner mouth. The same is true of saltwater fish who queue up at designated spots on coral reefs, where "cleaner fish," identified by special colors and markings, are waiting to scour them for parasites and other edible detritus. The determining factor of mutualism is consent: the crocodile does not have to open its mouth for the bird and nobody forces the fish to visit a cleaning station. The giraffe, however, would have a hard time keeping tickbirds off itself, so they tolerate the birds who cling to them and chow down selectively at the buffet on the giraffe's body. Behavioral Ecology: Red-Billed Oxpeckers: Vampires or Tickbirds? What Animal Cleans the Inside of an Alligator's Mouth?